Shortlist SEARCH ARTWORKS HIDE Medium None selected Price Range unrestricted Use left and right sliders to adjust LOW and HIGH price Size width x height cm Loaction Stored None selected Locality None selected Artist Leave empty or type-in a single keyword to search in artist name Keywords Leave empty or type-in a single keyword to search in work title or work description. By Catalogue No. Leave empty or type-in Cooee catalogue numbers (digits only) separated by commas eg: 1463,3119 to find selected works. Search by numbers is exclusive of catgory search above. 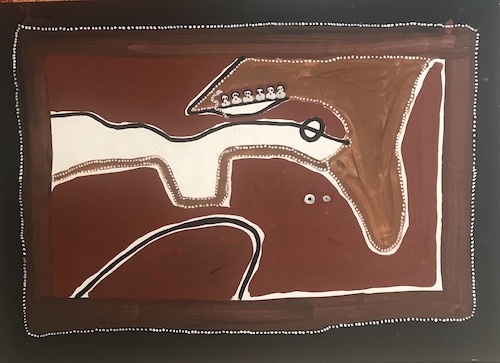 Profile Cultural Info Market Analysis Market Performance Top 10 artworks sold at auction Available Artworks JACK DALE MENGENEN 103 Career Overall Rank 147 2018 Market Rank Born: 1922 - 2013 Active: 1998 Region: Kimberley, WA, Kimberley, WA Community: Derby Outstation: Imintji Language: Ngarinyin PROFILE Jack Dale lived in the remote and rugged Kimberley region of northwest Australia since childhood. His life spanned from the turbulent and often bloody years of early white settlement through to a life working cattle and traveling the north west as he accumulated knowledge and the ancient stories of the land and its creation spirits. The son of a hard-living Scottish man and an indigenous woman of the Ngarinyin people, he spent his earliest years wandering the bush tracks further and further from his home. His cruel and often violent father shot him in the leg and tied him to a tree to stop him ‘running away’ while still a youth (Dale 2006). His father died however, when Jack was still young and to his good fortune Jack was taken under the wing of his Aboriginal grandfather who taught him Narrungunni law and protected him from the prevailing social attitude toward mixed blood children. During this time, Jack walked many hundreds of miles with his grandfather, learning about country and the ancestral spirits that created it. They often had to hide from police patrols that would forcibly take Aboriginal children to be housed in institutions. Sometimes, from hiding places, they watched chain gangs of Aboriginal men being marched away by white men on horseback and later saw the arrival of the Afghan camel drivers. When he began painting in his late 70’s at his home in Derby, these and other historical incidents that he witnessed first hand during his youth became some of the important subjects he explored in his art. Melbourne natural history photographer, artist and entrepreneur, Neil McLeod visited Jack Dale during the late 1980’s at the suggestion of David Mowaljarlai and anthropologist Kevin Shaw. Ten years later, in 1997, re-introduced by Shaw, McLeod asked Dale if he would consider painting. The old man, by now in his 70’s, was excited that someone had come to him at last to record his knowledge and traditions. McLeod supplied the materials and encouraged Dale to begin painting. As one of the last of the dwindling generation of old men who possess a complete knowledge of the rituals, law and culture of his people Jack Dale had become a vital link to the past. A custodian of ancient stories about the land and its creation, his most compelling and mysterious works focus on the Wandjina and other important spirit beings that created the land and instituted the laws that govern human behaviour. Wandjinas are powerful fertility spirits responsible for the life-giving monsoon rains. Jack believes that the ‘big boss’ Wandjina can rally his attendants when conflict occurs between humans. These spirits are depicted in a distinctive style; ghost like, with haloes, large dark pool-like eyes and with no mouth for, according to Dale, giving them a mouth would mean the heavens would open and the rain would never cease. “Whites have the bible. We have our Wandjinas. We have to go to these places else we are empty,” said Dale. These Wandjina sites, located throughout the Kimberley, are over 60,000 years old and are painted on rock overhangs, often marked by striking geological features like the Djalala or ‘marking stones’ that indicate their presence.